A delicious and versatile recipe, sure to be a hit any time of the day! Preheat the oven to 200ºC (180ºC for fan assisted ovens), gas mark 6. Lightly grease a 12-hole mini muffin tray. 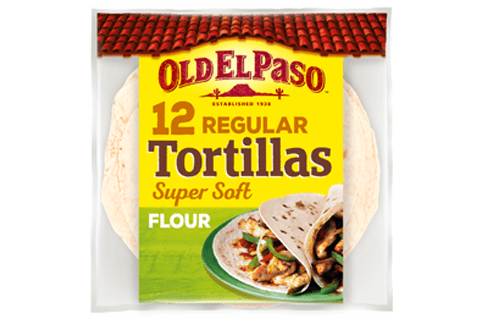 Lightly brush both sides of each tortilla with a little olive oil then cut each one into quarters. Press 12 of the tortilla quarters into the mini muffin tray, folding to fit. 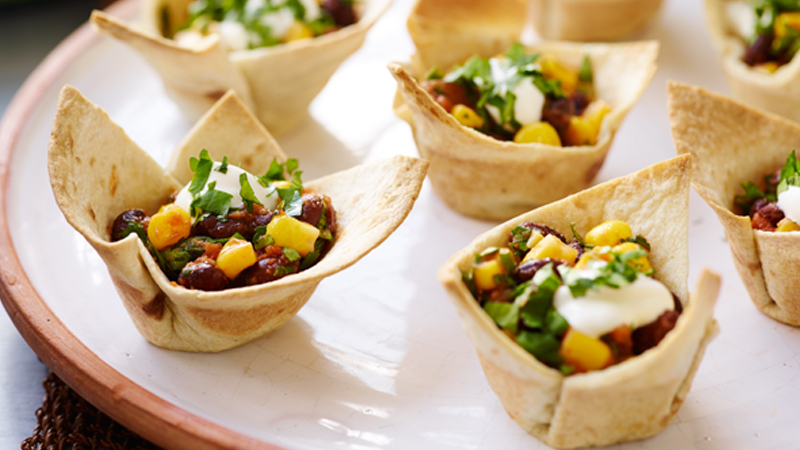 Line each cup with a small piece of foil and fill with a few baking beans (press down firmly to ensure the tortilla quarters sit neatly in the muffin tray holes). Bake for 6-7 minutes until crisp and golden brown at the edges. Transfer to a wire rack, remove the foil and baking beans and leave to cool completely. Repeat with the rest of the tortilla quarters, to make 32 ‘cups’ in total. Mix the salsa, chopped coriander, cumin, chilli, sweetcorn and beans in a medium bowl. Just before serving, spoon the bean mixture into the ‘cups’. Top each with a small dollop of soured cream and garnish with a coriander sprig. Serve immediately. Bake the cups and prepare the filling the day before. Store in an airtight container and fill the cups just before serving. Add some cooked prawns and thin strips of smoked salmon for a luxurious seafood version.